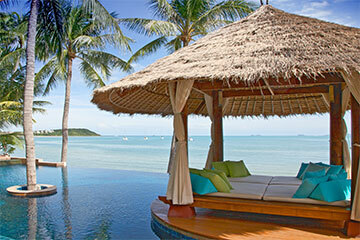 Luxurious Asian inspired beachfront villa with lush water gardens and spectacular sea views. Amenities satellite TV, DVD/CD player/iPod dock in all bedrooms, WiFi broadband internet, fully air-conditioned, fully equipped kitchen, heated Jacuzzi, and gym. Upni Duniya is an expansive, luxurious villa located on Bang Rak beach, overlooking the famous Samui landmark of Big Buddha temple. Highly specified and richly decorated, the property is set within lush tropical gardens that include numerous water features and artifacts. The architecture is symmetrical about the central walkway of illuminated stepping stones that leads from the entrance to the beachfront swimming pool. The large infinity-edge pool stretches across from the master suite deck to the beachfront thatch-roofed sala pavilion, which is furnished with cushions for relaxed lounging. The poolside deck is furnished with loungers, sofas, and an al-fresco dining set. Behind the pool deck and sala, the open-plan living room includes an air-conditioned lounge and dining area. The living room features foldaway glass walls on 2 sides facing the sea views, polished hardwood floor, and vaulted wood-paneled ceiling. This idyllic living space is fully equipped with a kitchen, bar, espresso machine, and entertainment system, including a large LCD satellite TV, and sound system. With 9 en-suite double bedrooms, Upni Duniya accommodates up to 18 guests in opulent comfort. The bedrooms are designed for optimal privacy, and are located in 5 detached buildings. At either side of the ornate gated entrance are 2 storey buildings, each containing a pair of lavish bedroom suites on the first floor, with great sea views over the property. On both sides of the walkway, there are 4 mirrored bedroom suites, entered across wooden walkways over the surrounding ponds. Each of these bedrooms includes a private balcony with a sumptuous sofa. The lavish master bedroom suite is located in a detached beachfront pavilion, and benefits from a private deck with loungers and a large Jacuzzi, together with direct access to the beach and pool. All 9 bedrooms are superbly finished, and beautifully decorated, with accent colours, while maintaining equivalent levels of luxury standards. The bedroom suites are all air-conditioned, with ceiling fans, wooden floors, and fabulous views. State-of-the art technology includes 32” LCD TVs, with satellite connection and DVD players, individual Denon sound systems, with ceiling-integrated speakers, i-Pod docks, mood-lighting, and complimentary broadband WiFi internet connectivity. The en-suite bathrooms are fitted with rain showers, tubs, and Nahm hardware. The master suite includes a private lounge with a projector TV system connected to 3 satellite networks for a cinematic experience. An enchanting grotto with a large hot-tub separates the lounge from the beachfront bedroom, which features super king-size bed, a day bed, dedicated fax, phone, and WiFi internet service. The master bedroom opens onto a private wooden deck, and a large heated Jacuzzi. This sumptuous master suite is rented as an optional extra. The fully-equipped professional kitchen at the rear of the property includes a full-time chef for in-villa catering, and the team of staff is always unobtrusively on hand to attend to every whim. -Rates are inclusive of buffet breakfast, airport transfers, and in-villa chef service. -Rates are specified in USD, exclusive of 10% service and 7% tax. -Extra bed charge is $50++ USD per night. -Minimum stay of 3 nights in standard season, 5 nights during high season dates, 7 nights during peak season, except for stays over Xmas and NY, minimum of 10 nights. Daily buffet breakfast, and maid service. 15% discount for bookings made at least 150 days in advance, or 5% discount for bookings made 120 days in advance. Applicable to full occupancy rates only, and cannot be used in conjunction with other promotions. Not applicable to Xmas/NY. *Check-in time is 15:00 and check-out time is 10:30, although early arrival and late departure may be requested subject to availability.